If you’re looking for a new Blogger template, you came at the right time. Hands down, this is the best template we’ve converted here at eBlog Templates. It’s a wonderful web 2.0 popular blog layout with some great built in ad spots (hence the template name) and features. It’s either a two or 3 column template (you can change it on the fly) so you get the best of both worlds. This Blogger template is what I call a “powerhouse” template since almost all the features you need are already built in. On top of that, it’s quite easy to setup and makes your blog look like a professional site without much effort. I predict this template will be a top template on this site within a few months, if not weeks. With the amount of effort that went into converting this template and attention to details, I sure hope you appreciate this free amazing new xml Blogger/Blogspot template. You can see from this screenshot that the actual editor is nicely setup so you don’t need to scroll or try and figure out how to click on the “edit” widget links. Most templates that you download make it tough to edit — not this one! This template does require some configuration in order to get it working as designed. Please follow the steps below if you’d like it to work properly. I also recommend backing up your existing template before changing just in case you run into any problems. You could also setup a new Blogger blog as a test area and try installing it there first. When you first install this template the top tabs will not be visible which is normal. 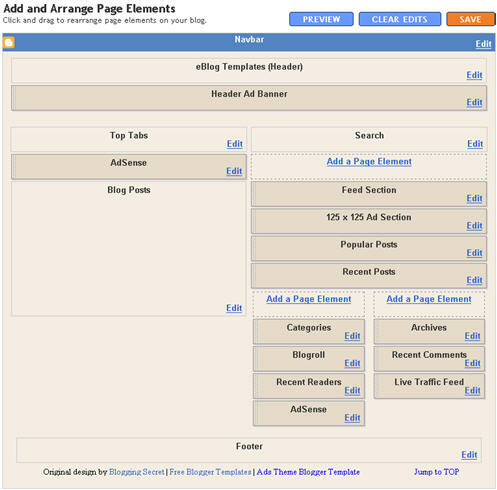 You’ll need to go into the Blogger page element layout editor and edit the “Top Tabs” widget. It’s a link list so just add whatever tabs you want. Don’t add a “Home” tab since it will automatically appear once you create and save the tab widget. To get this section working you’ll first need to have a FeedBurner account. If you don’t already have one, please read the “How to Setup FeedBurner on Blogger” article and then come back. Another option is to just delete this widget if you’re not interested in knowing your subscriber count or allowing your readers an easy way to subscribe. Once you’ve got your FeedBurner account, you’ll need to edit this template code and replace a few parts. Search your template code for the following line <!-- Replace Your RSS, RSS Email Subscription, and Technorati --> and then look right below that for the rss feed link. Next we’ll need to update the subscribe via email link with your feed id. You’ll need to make sure to enable subscribe via email within FeedBurner otherwise this part won’t work. After you’ve changed both of these areas save your template and check to see if it works. If you’re having trouble finding your feed name or id, please read our article above or see FeedBurner’s help section to locate it. If you’ve got ads to place in here, then just paste the code into the template. I recommend signing up for your own Text Link Ads account and using them. Each referral you convert, you get $20 (or $25 I forget). If you don’t have ads to use, you can either leave our default ads or delete this widget altogether. This one is easy to setup since we’ve already written an entire article dedicated to this. Please see “How to Setup Recent Comments and Posts Widgets” to configure these two widgets. You’ll need to have MyBlogLog and BlogCatalog accounts if you want to use this widget. The default widget will show the original author’s pictures so please either delete this widget or change the account ids to your own. Once you’ve setup these up, then edit the template code and search for <!-- Replace "2007112507294841" with your your mybloglog id --> and then replace the account numbers with yours. This is a really cool feature within this template and the best part is you don’t need to do anything to setup it up! There are some further options if you click on “options >>” on your actual blog page under the widget but that’s it. You should now have the template all setup and ready to go. I hope you enjoy this beauty and please make sure to keep the footer links intact since numerous hours of my time and the original designer were put into making it. That’s all we ask for giving away this template! Enjoy! Special thanks to Eric over at Blogging Secret for designing this wonderful template originally for WordPress. Update (3/3/08) – Per a couple requests and to make this template even more flexible, I’ve changed how underlined links are handled. You can now edit the underlined color via the Blogger “Fonts and Colors” section along with 10+ additional other color variables. Less work for you having to mess with the .css template code now. Update (3/5/08) – Added in post author tags so you can toggle the “By Author Name” within the posts. Also compressed the css so the file is much slimmer and cleaner. Update (3/14/08) – The individual posts Google AdSense code block was missing and has now been added to the template code. Update (4/18/08) – Fixed layout screen so the two widgets aren’t overlapping. thanks for the template please help me to use the submit add and post add option by visitors and also i want to bulk upload the date from excel is there any way to upload . wow . . . . like this! !